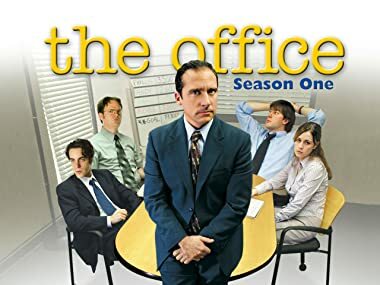 In this first season of The Office, Dunder Mifflin Regional Manager Michael Scott (Steve Carell) leads the documentary team and his staff on a journey through inappropriate behavior, well-intentioned but misguided comments and a myriad of poor management techniques. Michael tries to spare the staff by keeping news of possible downsizing a secret, which only makes them more anxious when they find out anyway. Michael's offensive behavior prompts the company to sponsor a seminar on racial tolerance and diversity. Jim has trouble securing his biggest yearly commission. When forced to pick a cheaper health care plan, Michael, rather than lose popularity points with his staff, shirks the responsibility to Dwight. Amid rumors of downsizing, Michael tries to raise morale with a birthday party, even though it's no ones birthday. Dwight asks Jim to form a "Survivor"-style alliance. Michael and gang play the warehouse workers in a not-so-friendly game of basketball. Overly confident, Michael bets that the losers will have to work on Saturday. Dwight, Michael and Jim all vie for the attention of an attractive woman who comes to the office to sell purses.